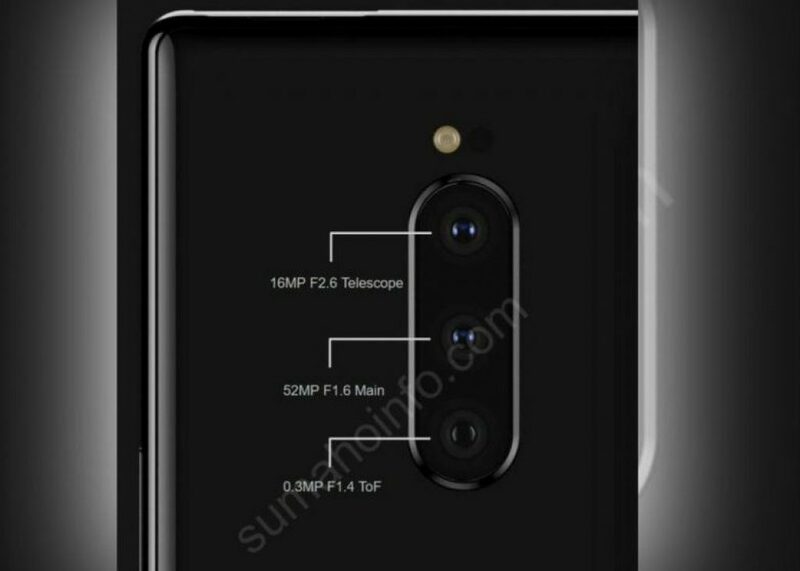 Fresh leaks confirm the rumor that the Xperia XZ4 will have a triple camera set at the rear. This setup now consists of a 52-megapixel primary sensor with an f/1.6 aperture, a 16-megapixel telephoto lens with an f/2.6 aperture and a 0.3-megapixel ToF sensor with an f/1.4 aperture. If this turns out to be correct, then it is the first smartphone with such a high-resolution camera, leaving the recently launched Honor View 20 and the Redmi Note 7 behind. The 0.3-megapixel ToF sensor is used to support autofocus on the Xperia XZ4, but can also be used for 3D scanning functions. Sumahoinfo, who reported the leak, claims that the leak came from a Reddit message and had a CAD-based feature that had been leaked in the past. Recently leaked images also showed the longer display than normal. A recent leak, similar to a Chinese or Taiwanese version of Sony’s official website, has revealed a lot about the Xperia XZ4. It reported that the 6.5 OLED display will have a QHD + resolution (1440×3360 pixels) with support for HDR and Corning Gorilla Glass 5 on top. It is said that the Xperia XZ4 is powered by the Qualcomm Snapdragon 855 SoC and has 6 GB of RAM and 128 GB of built-in storage space. The storage is said to be further expandable to 512 GB via microSD card slot. Sony is said to send the Xperia XZ4 standard with Android 9.0 Pie. It will be packaged in a large 4.400 mAh battery with support for Qnovo Adaptive charging, USB PD and Qi wireless charging. Rumor has it that the Xperia XZ4 will appear in a new Deep Purple color, along with the black, silver and blue color options. Sony has managed to keep the price and availability of the Xperia XZ4 under wraps but will reveal it at MWC 2019.